Finally I can up two of the progress bars from 0 to something. We are able to mark items 1A (treat for termites), 1B (remove wood from under house), and 3H (wood rot, crawl space door) off of the pest report. We still have quite a bit to go but it's a start. I ticked this progress bar up to 30% done. I ticked the progress bar for the northeastern bedroom up to 12%. This bedroom (the one we've been sleeping in) has hardwood floors. It looks like at some point it probably had carpet in it.. and the carpet got wet and moldy. The carpet was then removed leaving us with a hardwood floor that is absolutely nasty. In places it's moldy black and splotchy. Just horrible. 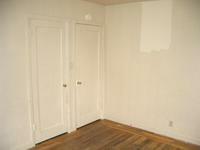 Add to that, the bedroom is painted in a drepressing muddy beige color with mold spots on the wall. It's just a depressing room. It makes me really glad that the light's off most of the time when I'm in the room. In the picture, you can see the stellar job Mr. O, previous owner, did on painting the room. The patch on the right-hand wall makes me think that he contemplated adding a second coat of paint to the room... but half-assedness won out in the end. So now we have a splotchy hardwood floor.. and a splotchy muddy beige room. Way to go Mr. O. At the bottom of the picture you can see the hardwood floor. This is clean-swept. The blotchiness is from the stains. (my camera is still missing so no better pics of the floor are available). The last time Rolf came to visit he said he though we could save the hardwood floor (it's 3/4 inch oak). So we had him come back on Thursday and start on it. Rolf and Marc rented an orbital sander. After about an hour with this they went back to the rental place and got a drum sander as well. The water damage in the bedroom had caused the boards to cup. The orbital sander just wasn't going fast enough. After a couple passes with the drum sander we're starting to see some real progress. The floor still is blochy. I don't think we're ever going to be able to get that to go away. At least now it's smooth with a blochy stain. Today Marc is finishing up with the orbital sander. The plan is to sand it smooth today then sweep up all the sawdust. Then we'll wipe it down with mineral oil. The goal is to be able to apply the stain on Monday. Hopefully we'll be able to get the blochy stain on the floor and the stain color to match close enough that the floor looks reasonable. As it is, the floor looks 90% better than it did. After we get the closet in this room closed off (as part of the bathroom remodel) we'll be priming the room and painting it. I'm thinking a nice yellow color with red tones. Not orange.. more of a golden yellow. I want a color that counteracts the cool tones we're getting because this is a northern room.